The Prepara Gourmet Oil Mister is the ideal device for those looking for healthy living and an environmentally friendly oil spray alternative. 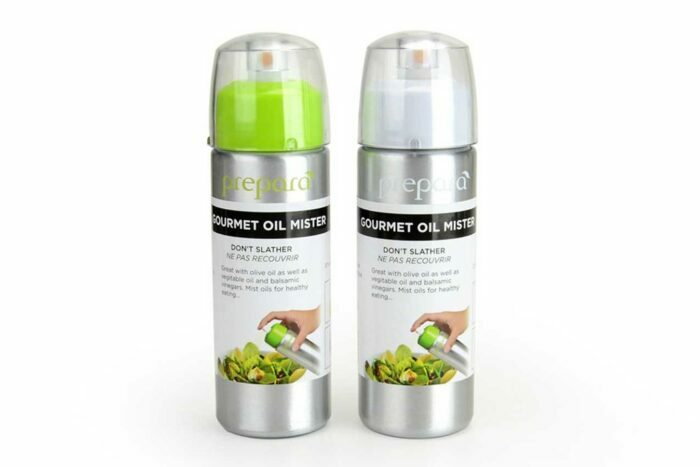 Replacing traditional aerosol cans that are harmful to the environment and your cookware. It allows you to spray a thin even coat when greasing a pan or tray, and is perfect when dressing or seasoning your favourite salads. The clog free filter allows the Mister to be used with not just oil and vegetable oil, but also your favourite balsamic vinegar. It is easy to use too; simply fill through the extra wide mouth, pre-pump the jar and then you are ready to go. Functional enough for the kitchen, yet stylish enough for any dining table.